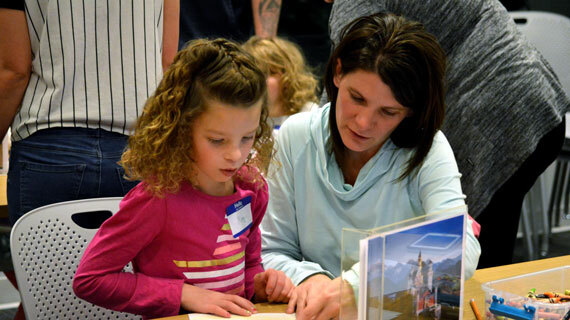 After hosting many popular family activities during the 2017 holiday season, the Southern Utah Museum of Art and artsFUSION are bringing back visual art activities for southern Utah families with Family Days. These free programs will be held on the final Saturday of each month at the Southern Utah Museum of Art from 2 p.m. to 4 p.m. and will be taught by Southern Utah University students. This past semester, families created artwork together with many activities including African block printing, paper art, and watercolor snowflakes. Thanks to the continued support of artsFUSION, the Southern Utah Museum of Art’s Learn + Experience team look forward to continuing this program for families throughout the southern Utah area. Family Days are free and open to the public. Families are welcome to drop in anytime between 2 and 4 p.m. The activities will be held on January 27, February 24, March 24, and April 28. See how you can create with the whole family during Family Days at SUMA. For more information, please visit www.suu.edu/pva/suma/experience/family-programs.html.